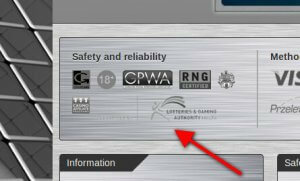 Play Azart is displaying the old LGA (Lotteries and Gaming Authority) seal with a link to the old LGA homepage. Unbeknownst to Play Azart, the LGA rebranded to the MGA (Malta Gaming Authority) in January 2015. If they were a Malta license holder, chances are they might have been aware of this.